You would think that finishing up a major work project and being done with overtime (for the time being) would lead to a major spurt of knitting….but then you’d be wrong. Unfortunately, hanging over my head was still the dreaded spring cleaning. Dreaded, mostly because it takes so darn long. I don’t feel like I have a lot of “stuff”…but there’s still more than enough to go through. And of course, I’m one of those people who feels the need to alphabetize their CD collection. (I’m also one of only two people at work who can find a contact’s business card in less than 30 minutes. No, I don’t think it’s a coincidence.) I seem to have two extremes – either I’m chronically organized with everything in its place or I’m nose-deep in piles that I haven’t taken time to work through and put away. Which makes cleaning oh-so-fun. High standards and a year’s worth of failing to meet them…. So, anyway, knitting has been sparse. But the spring cleaning is finished (yea!) and I’m on vacation all of next week (double yea! ), so I’m hoping to get back in the swing of things. I do have some knitting I haven’t shared yet. This is a very scrunched up and almost finished Artichaut, in Briar Rose Angel Face. Earlier this year Anne asked me to knit a sample for her booth with Chris at Sock Summit later this summer. Since the pattern wasn’t released until June 1 (in the Summer Twist Collective), I couldn’t share it until then…by which point I was inundated with the rest of my life, of course! It’s another lovely Knitspot pattern, although trickier than most, as there is patterning on both sides. (My simplification solution has been stich markers between repeats. Lots of stitch markers.) The yarn is also very lovely, an alpaca laceweight. It’s actually much nicer on the hands to work with than the yarn I used for my Alhambra. But then again, I’ve yet to have any complaints about any of Chris’ yarns. 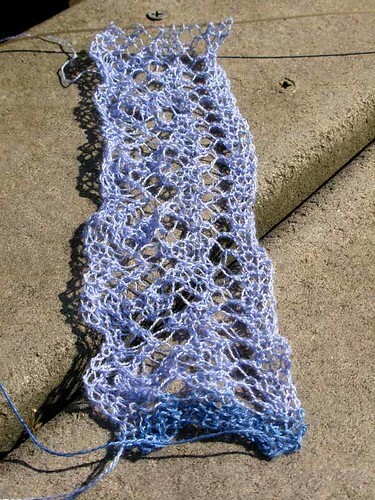 Moving from challenging to even more challenging, I’ve finally started the Lerwick Lace Shawl from Heirloom knitting. I’m using a cobweb weight cashmere-silk blend (from Colourmart) which is absolutely lovely to work with. Even though I’m using 1.5mm (US 000) needles. (Eek!) I have so far about 8 points finished on the edging, out of 152. I think I’ll be working on this one a while… It will make good summer knitting though – it’s very lightweight and I don’t think the fine yarn will stick to my hands quite as much as heavier, woolier yarns do in the heat of summer. I may have to find a somewhat easier project to work on for breaks from this, however. At least I have plenty of yarn to choose from! I had to go around to the side of the house over the weekend to check if the phones not working was a result of in-the-house or out-of-the-house issues (Answer: out-of-the-house. A very naughty squirrel chewed through the lines.) I don’t usually venture to this side as it’s just a narrow strip between our house and the neighbors, so I usually miss these. However, this year the timing was just right to stumble upon these bright little beauties. 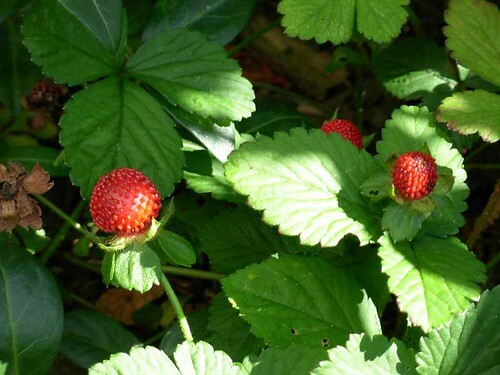 I believe they are alpine strawberries, and they’re not very edible (at least, not compared to the local farm berries my mom picks every year – I’m not sure anything beats those), but they are really a cheery little spot of color. Cleaning is hard for the chronically organized, isn’t it? It always feels better when it’s done, though! And isn’t it funny how people make fun of you for alphabetizing, and then come to you when they can’t find things? The lace is looking beautiful. I love the color on artichaut. Hope you find some knitting time soon! oooh, the shawl looks beautiful! i hope you get to finish it soon so you feel the thrill of the blocking! and of course, you are very welcome to do that at my place! 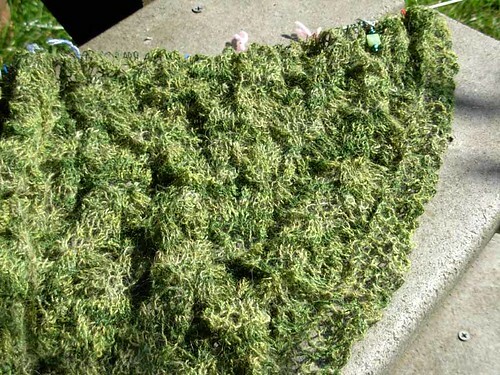 The kknitting looks absolutely gorgeous, I’m looking forward to seeing the green one blocked, what a beautiful colour. I hate spring cleaning too, just bcause we have so, so much junk to go through.